Fig. 276 Sea zonation . 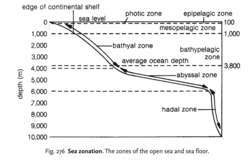 The zones of the open sea and sea floor. the divisions of the sea and sea floor for purposes of reference to specific areas as shown in Fig. 276.